Police on Tuesday are investigating a shooting at a San Jose home near an elementary school, according to the Santa Clara County Sheriff's Office. Pete Suratos reports. Police on Tuesday are investigating a shooting at a San Jose home near an elementary school, according to the Santa Clara County Sheriff's Office. The shooting occurred during a gathering at a Delia Street residence around 2:30 a.m., department spokesman Sgt. Rich Glennon said. A neighbor who heard gunfire called 911, he said, but responding officers could not find a victim. Around the same time, officials received a call from a local hospital about someone having been brought in with a gunshot wound. The still unidentified victim is expected to survive. Sheriff's officials believe that the person may have been shot on Delia Street, but are still investigating the connection. 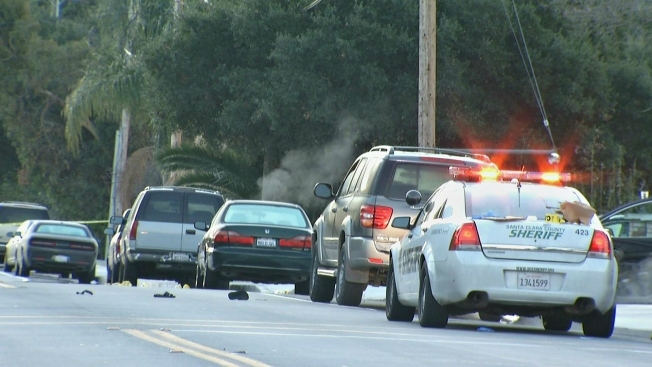 While investigators were at the Delia Street crime scene, deputies also found a gray SUV that was parked in the middle of the road near Kirk and Gordon avenues. Officials are looking into whether the vehicle is linked to the shooting. The crime scene, which is right off McKee Road, is in the neighborhood of Linda Vista Elementary School, but the school was not impacted, and there are no public safety concerns for students. Anyone with information about the shooting is asked to contact 408-808-4500.